I’ve seen a lot of makeup posts in my day, and I’ve decided it’s time to try my luck at it. Now, I’m no beauty guru. I couldn’t tell you what colors look good on you, or what is the best ___ for ___. Nope. I just know what I like, what looks good on me and what works with my skin. 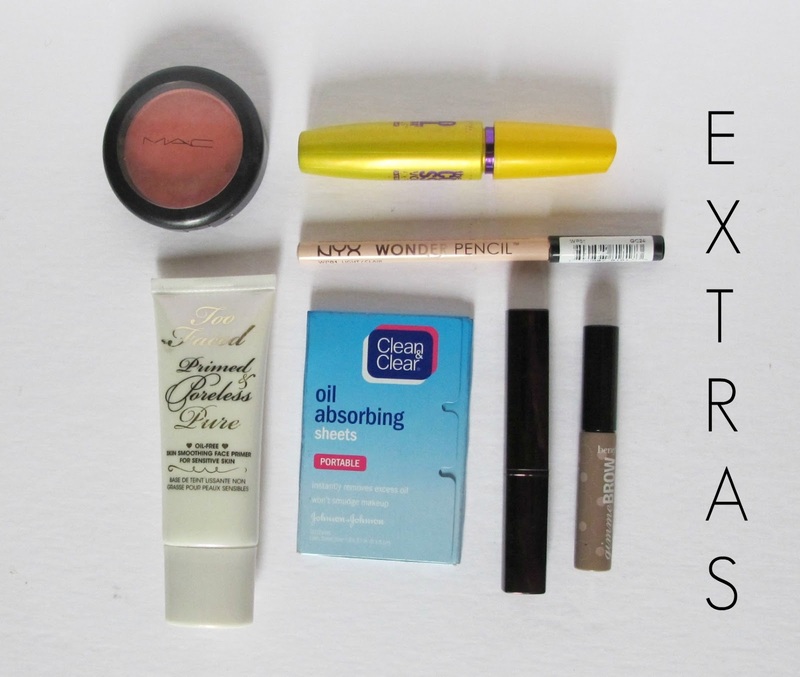 So you guessed it: I’ve decided to share what’s in my makeup bag. First of all, ignore how dirty my makeup bag is. Powder and black fabric don’t mix well, who knew?! Ha. Well, look past the dirtiness to see how cute my Theta bag is! It was a gift from my Big and it fits all my makeup + more and is absolutely perfect. You can find one similar here! So let’s start out with eye makeup. Recently, I’ve gotten into the habit of doing my eye makeup before my face makeup so when I’m putting on eye liner, or I get mascara somewhere other than my lashes (happens way too often) I’m not messing up my face makeup! Eye Primer: MAC Pro Longwear Concealer (in NW20). I know what you’re thinking. This is not an eye primer, it’s a concealer. I know, I’m well aware. Well, back when I was super zitty (mentioned above), I wanted very heavy concealers, and boy is this heavy. As my zits went away, I realized it was doing more harm than good for my pores. That’s when I happened to run out of eye primer and began using this. It’s great because it is heavy so the eye shadow sticks to it well and because it’s a lot of makeup, the bottle seems never ending. Mascara: Urban Decay Perversion. I am obsessed with this stuff. I’ve tried many mascaras in my day and this is the best by far. Although it may be a little pricey ($22), it’s well worth it. Eyeliner: Almay Liquid Eyeliner. Another one of my all-time faves, I’ve probably been using this liner for at least 4 years. I used to use pencil, but I’m one of those people who always ends up looking like a raccoon at the end of the day and figured out pencil was not the way to go. 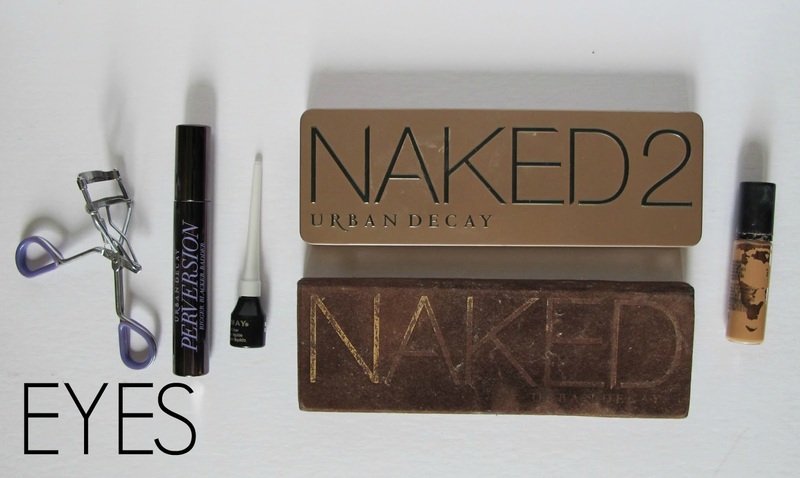 Eye Shadow: Urban Decay Naked and Urban Decay Naked 2. If you haven’t used a Naked palette I’m seriously questioning your sanity. These things are amazing. My favorites from the Naked palette are Sin, Naked, Half Baked, Smog and Dark Horse, and my faves from Naked 2 palette are Half Baked, Chopper, Snakebite and Busted. In addition to using these for eyeshadow, I use Busted from Naked 2 to fill in my eyebrows (I have very blonde, almost invisible eyebrows that do not match my brunette hair). Now on to face makeup. This has changed a lot over the years. I used to have horrible acne and was incredibly embarrassed by it, causing me to try any and every concealer and foundation known to man. Thanks to Accutane (read my Accutane story here! ), I no longer have to worry about having to cover every inch of my face every hour of the day, but I have found a great concealer and foundation for my skin! Foundation: It Cosmetics Your Skin But Better CC Cream with 50+ SPF (in fair). A sweet sales woman at my local Ulta store showed me this foundation and I’ve been in love ever since. It doesn’t feel too heavy, it blends well and most importantly it has a ton of SPF in it! Bronzer: NARS Bronzing Powder (in Laguna). This bronzing powder is absolutely amazing. After winning numerous awards in every beauty magazine I knew I needed to try it. Without being glittery or shimmery, this bronzer is perfection. Blush: Bobbi Brown Blush (in Slopes 17). I just recently found this in a drawer of makeup in my room at home and ended up loving it. It’s pink and coral, but not too bright. Concealer: Dermablend Quick-Fix Concealer (in Natural). Like I said above, I had some acne issues. This purchase came when I still had problems, and my mom had done some research (bless her heart) and found that this concealer is great for sensitive skin, had SPF in it and had great coverage. I hardly ever use it now (thank you Accutane!!!!) but it’s still great when I get a blemish here or there. Setting Spray: e.l.f. Studio Makeup Mist & Set. I’ve never been sure if setting spray was a hoax. Like does spraying water really make all my makeup stay on my face for hours? Who knows. But because this was so cheap ($3!) I decided to give it a go and I cannot attest to if setting sprays are legit or not, I’ve never had an issue with my makeup after using this. The brushes I use are not fancy in any way, but they work. I do use a brush for my foundation because after talking to multiple Sephora, MAC and Ulta employees they all prefer brush application over sponge or finger application. It’s less germ-y and looks better overall. 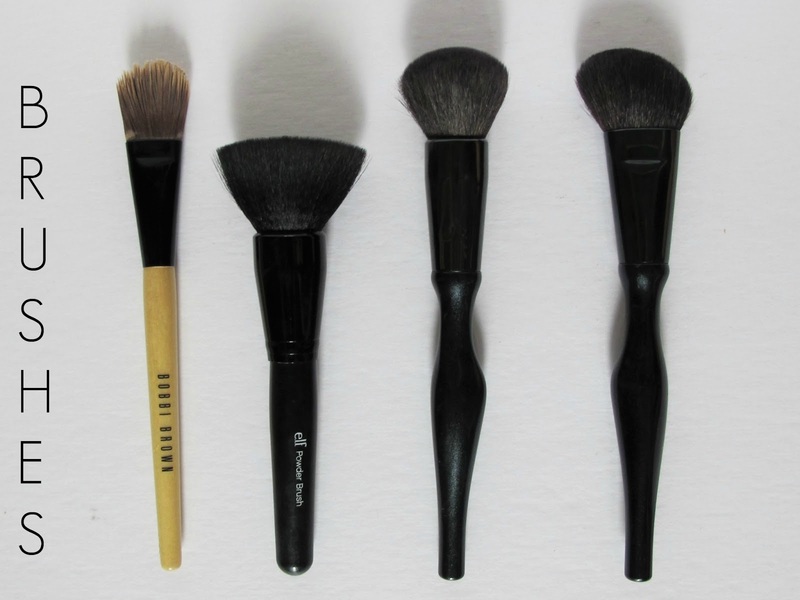 Foundation: Bobbi Brown Foundation Brush. My mother went through a Bobbi phase when I was in high school so I ended up getting this little hand-me-down. I would never spend $40 on a foundation brush but she did so I’m not really complaining. I love this thing. 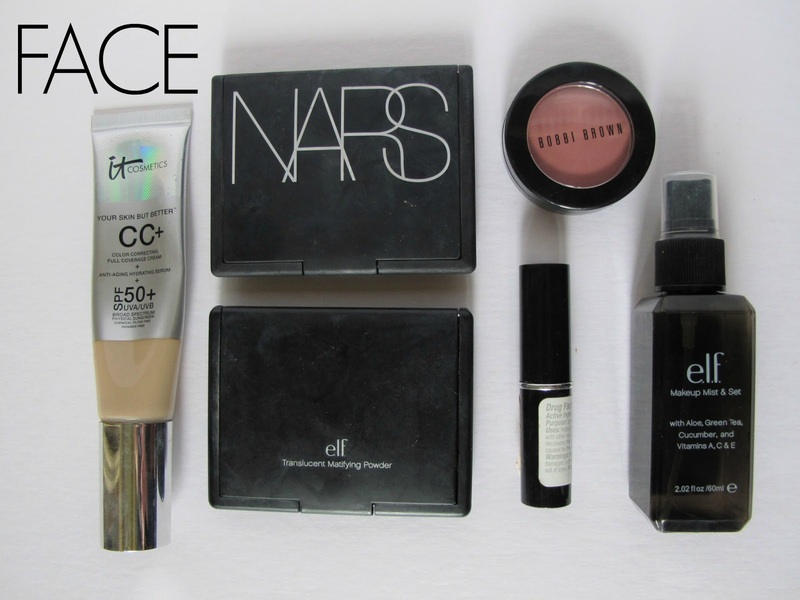 Powder: e.l.f. Studio Powder Brush. Obviously, when I’m buying my own makeup brushes I go for the cheapest possible ($3) but this bad boy works just as well as a $40 one! Bronzer: Find a similar one here. I have no idea where I got mine but they work great. I usually use this brush to contour my bronzer. Blush: Find a similar one here. Once again, no idea where I got this, but clearly I use it for blush. So obviously I have a little bit more room in my makeup bag, so I keep the stuff I don’t use every day in there as well. This way if something suddenly comes up I’m prepared. Blush: MAC Blush (not sure what color!) Unfortunately the name of this color rubbed off, but it’s a beautiful coral hue. Primer: Too Faced Primed & Poreless Skin Smoothing Face Primer. I actually haven’t used this in forever because I feel like it makes my skin feel oily before I put on my foundation but it is a good primer if you need that. Oil Absorbers: Clean & Clear Oil Absorbing Sheets. These are perfect for when your face is oily but you can’t take off your makeup. I especially loved using these during recruitment last year and highly recommend putting them in your purse! Mascara: Maybelline Volum’ Express Colossal Waterproof Mascara. For those times you know you might cry (i.e. weddings, funerals, recruitment…) this is perfect. Its a great volumizing mascara but still waterproof. Eye Pencil: Nyx Cosmetics Wonder Pencil (in Light). I recently picked this up at Ulta randomly and love it. I like to use it around my tear ducts to lighten up my eyes and on my waterline to make my eyes appear to be bigger. Lipstick: Laura Mercier Rouge Nouveau Weightless Lip Colour (in Coy). I got my makeup done by the Laura Mercier counter for my junior prom and although I did not enjoy my experience (they’re much more fit for older women) I did end up buying this lipstick and still wear it on occasion. I love coral (can you tell?) and this is the perfect coral color without being too bright. It has no sparkle so I usually put a clear lipgloss on top of it. Brow Gel: Benefit Cosmetics Gimme Brow (in Light/Medium). As I mentioned above I have practically invisible eyebrows and I finally realized in the past couple of years I need makeup to change that (thank God). I purchased this and used it for a bit until I realized it made my eyebrows appear matted down rather than natural. That’s when I started to use my Naked 2 palette for my eyebrows. That’s about it for my makeup bag. As you can tell, I like to keep it fairly simple. You won’t find me doing any flashy eye liner or fake eye lashes (I threw those away after I finished competitive dance!). Now that I’ve shared my makeup, tell me about yours! 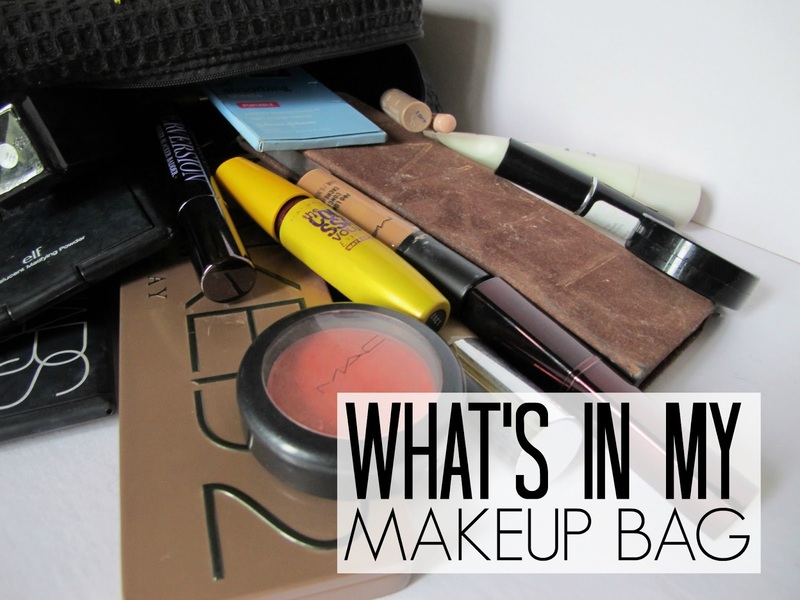 What’s in your makeup bag? Next Post My New Blog Design!